Two States Solution – Is it feasible? 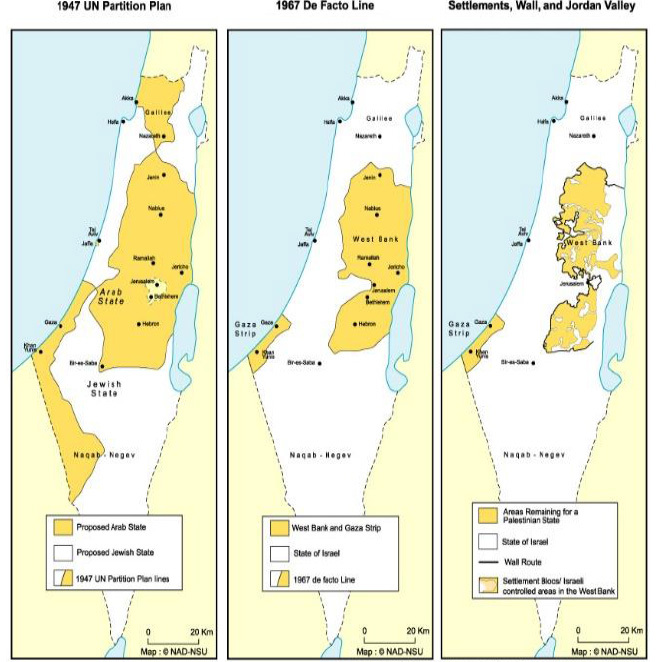 The Two States Solution has been promoted throughout several decades in the foundation of the UN partition plan made in 1947, prior to the establishment of the state of Israel. Based on this plan, the land should be divided between two ethnic groups: The Jewish people who were seeking a place of residence after the Holocaust and the Palestinian Arabs. “Gaza War” in 2008-2009 and Operation “Pillar of Defense” in November 2012. These wars have changed the geographic division of territory in the region, particularly, due to the fact that the state of Israel managed to retaliate and thus widen its borders. The core of the problem is the fact that both parties claim to have historical possession of the land, particularly Jerusalem as a holy city for both Jewish and Muslim religions. Therefore, one of the main arguments in the current peace process between the state of Israel and the Palestinian Authority is the division of Jerusalem into the capital of Israel and a future Palestinian state in East Jerusalem. The Palestinians would prefer not to let go of the right of return for their refugees since they believe it is their basic right once a Palestinian state is established. This is not acceptable by Israel because of the fear of losing demographic superiority. The Israelis do not want to stop expanding their settlements unless there will be a permanent agreement. The expansion of settlements is not tolerated by the Palestinian Authority. The Palestinians would rather not have a state which will not have any security services to protect its borders. However, the Israelis will only agree for a demilitarized Palestinian state, at least in its early stages. Due to potential security hazards, Israel will not allow free access between Gaza and the West Bank, despite the desire of the Palestinians to have such access. It is highly probable that the Israeli government will maintain its full possession of Jerusalem as its capital, and would not share it with another state while the Palestinian Authority requires it as a basic condition. These arguments have been the core of the dispute that is seen as complex and not easily resolvable. On the other hand, Chief Israeli peace negotiator and Justice Minister Tzipi Livni said: “Bennett is part of ‚radical minority’”. (5) She further explains that there is obviously a price that the state of Israel has to pay, but she believes that the majority of the Israeli citizens are interested in having peace and, therefore, any peace agreement should be submitted to the Israeli citizens’ voting. Livni asserts that the risks of not signing an agreement during these peace negotiations might result in the delegitimization of the state of Israel in the world, might impose boycotts and worsen future possibilities for long lasting solution due to ongoing settlement expansions. On the Palestinian side, the two States solution is can be seen as positive since it would give a possibility to form their independent state, have solid borders, join international organizations, raise more funds and declare Jerusalem as their capital city. As complex and delicate the status in the Middle East is, a “Two States Solution” has its positive effects for both sides and negative as well. Due to this fact it is impossible to judge whether it is feasible or not on a practical scale. Particularly, since the current peace process does not seem to bare fruitful outcomes. The writer of the article, Mark Mattayev, is an Israeli High Tech Entrepreneur and International Business Management student in Finland.